Pre-emergent crabgrass control as advertised does NOT prevent crabgrass! In fact crabgrass must germinate and grow in order for the control product to stop the crabgrass. You see, when applying pre-emergent crabgrass control on your lawn, the material dissolves and a microscopic barrier is established. Once the crabgrass seed germinates and grows into the barrier created, the crabgrass plant absorbs the control product and its growth is stopped. Crabgrass will germinate when soil temperatures reach 55 degrees for 10 days. In Columbus, germination typically happens between April 20th - 25th, while in Cleveland, it does not happen until the first week of May. Preemergent should be applied in Columbus by April 15th, and in Cleveland by April 25th. The key to effective granular pre-emergent applications is particles per square inch. Each pre-emergent particle will dissolve to create the barrier to stop crabgrass, so to make sure the barrier is complete and thorough the key is to make sure the spread rate allows for an even and thorough distribution of particles. Did you know that each crabgrass plant will produce in excess of 150,000 seed that could germinate in your lawn? That is why it is so important to get early control so those seeds will not turn into large weed factories! Crabgrass is an OPPORTUNISTIC WEED. By opportunistic I mean it will grow in areas where there is less competition like bare spots or thin spots in your lawn. Additionally, you will also see higher concentrations of crabgrass along concrete or pavement where the soil heats up more and the pre-emergent breaks down quicker. Lastly, while crabgrass pre-emergent is necessary, the best form of control is to have a dense, thick, healthy lawn that prevents crabgrass the room to germinate and grow. 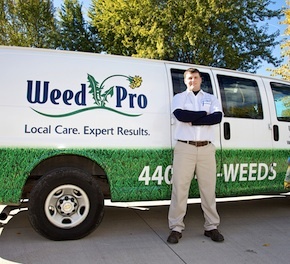 Weed Pro is Here to Help! If you are a do-it-yourselfer, make sure you check out our Free Spring Seeding Guide, by clicking on the link below.